The .AZW format is Amazon’s own exclusive ebook format for the Kindle. If you directly upload PDF eBook without optimizing that file for Kindle device then chances are that the eBook won’t have that Kindle optimized format. It may also happen that the fonts are too hard to read on Kindle. As we know, PDF is a readable format on Kindle, but you can make it better by optimizing text size and giving it a layout which is perfectly suitable for Kindle. That’s where you can use a PDF to Kindle converter such as K2pdfopt (short for Kindle 2 PDF Optimize). K2pdfopt is a program that optimizes the format of PDF files for viewing on small (e.g. 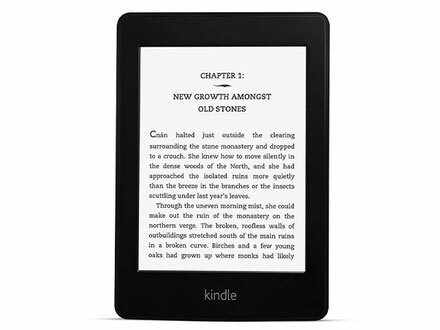 6-inch) mobile reader and smartphone screens such as the Kindle’s. 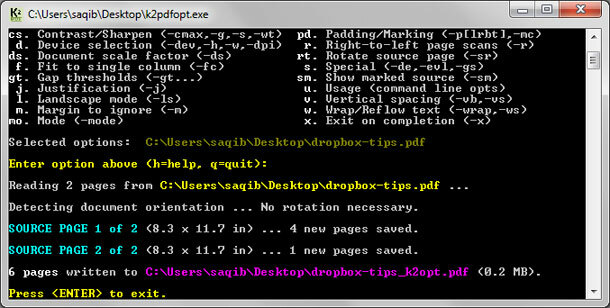 The new output file is an optimized PDF file by enlarging the fonts for better viewing purpose. Don’t think of K2pdfopt as a simple conversion program; under the hood lies many powerful features. It is fully automated and can batch-process PDF/DJVU files. K2pdfopt works by converting each page of the PDF file to a bitmap and then scanning the bitmap for viewable areas (rectangular regions), cutting and cropping these regions into multiple smaller pages. It will remove the excess white space found in the source document. It also fully preserves the rendered PDF fonts and graphics from the original file. Using K2pdfopt is very simple, in fact, a piece of cake. First thing that you’ll need to do is to download K2pdfopt. Once downloaded, all you need to do is to just drag and drop the PDF file or folder to the K2pdfopt icon. Next, you’ll be able to see the command prompt which will present with some options. If you want to try out with the default settings, then you just need to hit enter. This program will start converting PDF file to Kindle format with the default settings. Once the process is finished, you will get the new file in the same location where you have the original PDF file, with _k2opt added at the end of the file. To convert multiple PDF files, (also known as batch convert) you can put all your files in one folder and then drag and drop that folder to the icon. If for example, you want to output only particular pages, then in the CMD, type 2,3,5-9. This will create a PDF for the page range that you have entered. If you want to magnify the output font more than the default setting then type in o for output DPI and then hit enter. Now, enter the new output DPI value for example; 250 and hit enter. There are many such settings that you can control. K2pdfopt is one of those gems that come in handy when you are thinking to convert that PDF to Kindle-optimized format.